Question: Some are warning about the possibility of major aftershocks for the period to come. What sort of countermeasures do you have in mind based on your experiences from the Great East Japan Earthquake? They say the municipal government in Numazu is not taking countermeasures against tsunamis, for one. Is Ricoh reasonably prepared with an adequate business continuity plan? We have learned many lessons about business continuity from the last earthquake. On the basis of these lessons, we are going to review our existing business continuity plan to develop total disaster preparedness competence. Question: 85 yen/USD and 120 yen/Euro exchange rates were assumed in your financial results predictions for the fiscal year ending March 31, 2012. How big of an impact do you expect on your performance if the exchange rates stay at the current level of 80 yen/USD and 115 yen/Euro? Fluctuation by one yen of yen/USD and yen/Euro exchange rates will impact our operating income by ¥1.3 billion and ¥1.5 billion, respectively. Assuming that the level of both exchange rates you mentioned should stay for the whole year, their combined impact would be such that operating income would be approximately ¥14.0 billion less than currently predicted. Question: You announced entry to the LED illumination business. What is your vision of the business? We would like to make this business a good source of revenue by providing total customer value as part of our Eco Solutions business capitalizing on the Group’s sales and services network, rather than selling lighting equipment in isolation. 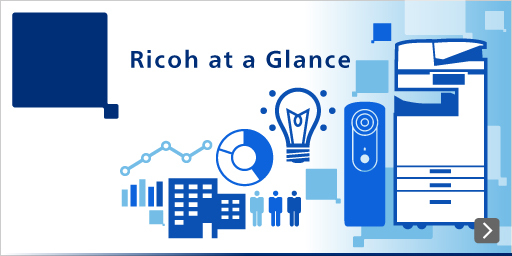 Question: What is Ricoh’s plan for contribution to the Tohoku region? We will reinforce the toner plant at Tohoku Ricoh with an extra investment of ¥11 billion. We are also considering the creation of a recycling plant in the Tohoku region as part of the Eco Solutions business. Question: You proposed an amendment to the Articles of Incorporation that all your public notices shall in principle go electronic. Is it appropriate? Public notices by newspapers are exposed to the general public only through one issue of the daily newspaper printing them, while electronic public notices have obvious advantages as they can be exposed continuously for longer periods. That is the rationale behind this decision. We will still issue public notices by newspapers when appropriate. Question: Ricoh’s operating margin in the previous fiscal year was lower than your industry peers. How are you going to improve this? The whole Ricoh Group is currently engaged in CRGP (Corporate Restructuring and Growth Project). We will undergo a thorough streamlining by implementing such measures as the elimination of redundant functions that currently exist within the Group as a result of M&As and organizational integrations to date, along with a 10,000 workforce reduction on a global scale. By these measures, we will be able to lower the break-even point, while committing ourselves for the next three years to building up an earnings structure that can stay above the impact from the adverse environment including higher yen. Question: What is the outlook of your digital camera business? Capturing capability is a versatile feature of a digital camera that can be exploited for many uses across society. We intend to further expand this promising business with lots of commercial application potential in the future. Question: You proposed amendment to the Articles of Incorporation states the addition of healthcare equipment business to your existing lines of business. What does it specifically refer to? We are planning to start developing an information system business targeting healthcare-related sectors, including the provision of eWriter Solutions utilizing electronic paper. We will be studying prospects for further commercial applications in this area. Question: How will you avoid the impact from the power shortage on your production activities? Ricoh’s business premises located within the jurisdiction of Tokyo Electric Power Company are divided into five groups for the purpose of rotating summer holidays. Thus, we are scheduled to cut total power usage by 15% while operating at full capacity. Question: More than a few companies are planning to transfer manufacturing activities to overseas locations in response to the power shortage in Japan. Are you considering this avenue at Ricoh, too? Does the 10,000 workforce reduction under the CRGP involve such transfer of activities? CRGP is a project designed to enhance staff efficiency and improve our earnings structure. We are not considering transfer of our manufacturing activities to overseas locations as part of our countermeasures against the power shortage.